Summary : A wonderful tea to have right before bedtime, as the high quality chamomile flowers in this tea blends perfectly with lemon, creating a nice, soothing late-night tea. Review : Here is is...4am. And I can't sleep. Why? Who knows. I mean, it isn't like I've done anything hot and exciting today. But well, the situation is what the situation is. And so, becoming rather desperate for some sleep, I headed out to the kitchen and poked through my tea collection for a chamomile tea. Why a chamomile tea? Simple, chamomile teas are the ideal bed-time tea. Chamomile teas have long been known to help people get to sleep. Whether it works for you or not, I have no idea. But for me at least, I've discovered that a chamomile tea will begin to make me VERY sleep in about 10-15 minutes after my first sip...and I'll stay that way for about 30 more minutes. After that, the effect of the chamomile seems to wear off. Regardless, the first chamomile tea to present itself tonight was called a Lemon Balm Chamomile Herbal tea from the Dragonwater Tea Company (now out of business). The Lemon Balm Chamomile Herbal Tea from Dragonwater Tea Company (now out of business) contains the following ingredients : lemon balm leaves blended with Egyptian Chamomile Flowers. I was pleased with the fragrance of the tea right out of the bag. The fragrance smelled exactly like what other quality chamomile teas with lemon have smelled like. This, of course, was a good sign. And as soon as I added water, the fragrance of the tea really unleashed itself. I was greeted by the typical hard to describe fragrance of chamomile, right along with a weak but sitll noticeable fragrance of lemon. By now, my spirits were beginning to lift and my desperation for sleep was becoming more pronounced. But despite it all, I sat around patiently for 8 minutes while the tea "did it's thing," so to speak. Thankfully, my patience was rewarded. Unlike poor quality bagged chamomile teas, which frequently have a "burnt" taste to them, this tea, which contains very high quality and LARGE chamomile flowers, had no hint of "burn" whatsoever. And more specifically, this tea had the very common "light" taste found in other chamomile teas. The flavor of lemon in the tea is pretty weak. Normally, I would pan a tea for that. But not this one. After all, a chamomile tea is supposed to have a light and weak flavor to it since it's a bed time tea. And who wants a powerful flavor of lemon dancing in your mouth for 30 minutes after the tea is gone? I'm also relieved to say, just like other quality, loose-leaf chamomile teas I've had before, this tea is working it's magic on me. Here I am, eight minutes past my first sip of this tea, and I'm getting sleepy. So I'm going to wrap this up. Night. Recommendation : Yes. This tea nicely blends lemon balm with high quality chamomile flowers. 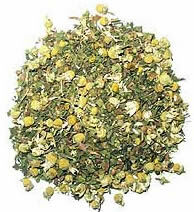 As the leaves are high quality, there is no worry about getting the "burnt flavor" found in bagged chamomile teas. And most importantly of all, this tea works...as I'm getting sleepy. And at the end of the day, that is exactly what you want a chamomile tea to do, to put you to sleep. Which, of course, is exactly what I plan on doing right now. Brewing Instructions : Use 1-2 teaspoons of leaves. Pour 1 cup (5.5 ounces, but 6 works quite nicely) boiling water over the leaves. Let the tea brew for 5-10 minutes. 8 minutes brewing time was used for this tea review.